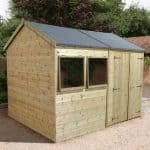 The 12 x 8 Double Door Shiplap Tongue and Groove Apex Shed is an impressive wooden shed that is equipped to hold a larger amount of outdoor and garden equipment. With high quality construction, large double doors and large windows, the Apex shed is an ideal storage solution at a fantastic price. You might also like to see the top 20 wooden garden sheds currently on sale in the UK by visiting the WhatShed wooden garden sheds awards league table. 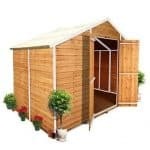 This Double Door Shiplap Tongue and Groove Apex Shed measures 12’ x 8’ and is ideal for anyone who is looking for an attractive garden shed to store typical gardening equipment, tools and garden furniture. The double doors make for easy access, whilst the apex roof not only prevents the build-up of rainwater, but provides a generous amount of headroom as well. Along one of the sides of the shed, there is a double window, made from durable styrene, which won’t shatter in the event that it is knocked whilst putting tools and equipment away. The window is secured with a horizontal hinge, which means that it can be opened to circulate the air, whilst preventing the rain from coming in. A plastic shed base is available to purchase as an optional extra to give your shed a level foundation on which to stand firmly. 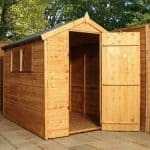 Traditional wooden sheds such as this Tongue and Groove Apex Shed aren’t difficult to find; after all, wooden sheds remain the most popular sheds on the market. 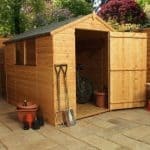 However, these types of sheds do come in a variety of sizes, with many different features to offer. In this section we will take a more detailed look at this particular model and see how it could suit your family’s needs to be the ultimate storage solution. Exterior: The shed is constructed from Baltic sourced pine in 14mm shiplap tongue and groove cladding, ensuring a durable and sturdy garden building. 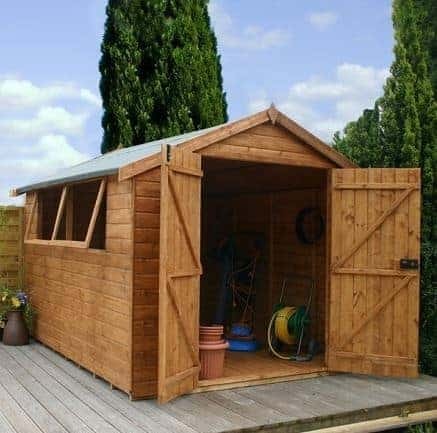 The shed exterior is very attractive with a charming log cabin appearance that would suit any style of garden and could be painted to match existing pieces. Interior: This 12x8ft shed is offers a generous space in which to store your outdoor and garden equipment. From garden furniture to tools and gardening accessories store it all within a dry and secure environment. Freestanding shelving or cupboards may be added to provide further storage and organisation for smaller items. Doors: The double doors are large and give a wide opening in which to store and access even larger garden items such as garden furniture and play equipment. Windows: The windows are made from 2.5mm styrene glazing and let a good amount of light into the shed interior during daylight hours. They fully open on a hinge to let fresh air circulate and prevent mould, damp and rot. Security: The Apex shed comes complete with a rim lock to keep the door firmly shut and your equipment locked securely inside whilst not in use. 12 x 8 Double Door Shiplap Tongue and Groove Apex Shed: How easy to build? It is recommended that the Shiplap Tongue and Groove Apex Shed be assembled by two people due to safety reasons and practicality because of the size of the panels. The shed will be delivered in a flat-packed package containing all of the panels, roofing, glazing, fixtures and fittings required for an easy assembly process. A comprehensive and easy-to-follow set of instructions is included to keep you on track during assembly. We expect that the Apex shed could be built within a day for people with a basic understanding of DIY. 12 x 8 Double Door Shiplap Tongue and Groove Apex Shed: What is the overall quality like? The Shiplap Tongue and Groove shed gives a great first impression due to both its large size and the high quality construction that can be seen with the attractive shiplap tongue and groove cladding. The 14mm shiplap cladding is used on the wall panels and flooring, made from a Baltic sourced pine which is denser and heavier than the usual timber, giving the shed extra strength and durability. The windows open on a hinge and provide ventilation, allowing air to circulate and preventing damp, mould and rot. This model carries a 10-year anti-rot guarantee from the manufacturer on the provision that it is kept well maintained throughout this time. 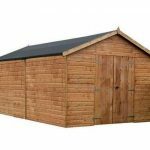 The 12 x 8 Double Door Shiplap Tongue and Groove Apex Shed is an attractive wooden shed that is plenty large enough for a household’s outdoor and garden equipment. 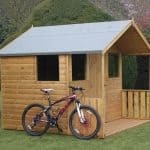 With its impressive 12x8ft dimensions and wide double doors, storing even large items such as garden furniture and bikes is easy; making this shed the ultimate year-round storage solution. At this price point it is priced competitively with similar sized and quality sheds.